Russia is set to ramp up its military presence in Crimea, the country’s envoy to the Alliance said justifying the move by NATO’s “stepping up activities” in Eastern Europe. The envoy also urged the US to pull out its nuclear weapons stationed in Europe. "Naturally, we will increase our forces in Crimea because NATO countries have stepped up their activities… in the immediate vicinity of our borders," said Russia’s envoy to the North Atlantic Treaty Organization (NATO) Aleksandr Grushko on Friday. He said Russia’s military boost falls in line with international treaties. “There is no ban in place prohibiting us to deploy weapons [in Crimea],” he added. Grushko’s words follow NATO Secretary General Jens Stoltenberg’s statement made on Thursday concerning the Alliance’s plans to increase military activity on its eastern European borders, with more air and sea patrols, amid non-stop exercises. "NATO is the strongest military alliance in the world and we are going to keep NATO strong by adapting," Stoltenberg said. NATO is planning to double its rapid response force in Europe, he said, adding that new command units will also be established in Latvia, Lithuania, Estonia, Poland, Bulgaria and Romania. Grushko noted that NATO is harming itself by turning away from practical cooperation with Russia. "As of now, we do not see any NATO desire to establish new paths of practical cooperation,” he said, responding to Stoltenberg’s statement. Recently NATO gave Moscow updated telephone ‘hotline’ numbers for military communication, but hasn’t taken the initiative to create new contacts, Grushko added. He said Russia hopes NATO will abandon the policy of “senseless expansion” and that common sense will prevail when the Alliance decides on Georgia’s and Ukraine’s membership. Grushko was referring to a statement made by Turkish Foreign Minister Mevlut Cavusoglu during Thursday's NATO foreign ministers summit in Antalya. Cavusoglu expressed hope that NATO's next summit will decide on the Alliance membership of Georgia, Macedonia, Montenegro and Bosnia. The Russian envoy expressed certainty that there were plenty of "sensible" members in NATO that understand "the huge risks associated with continuing the reckless 'Open Door' policy." 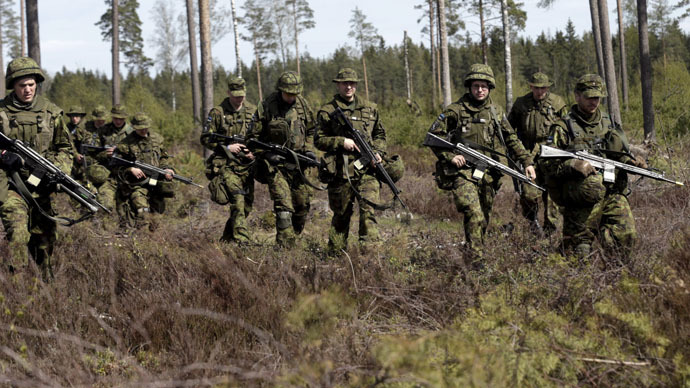 Since Russia’s reunion with Crimea and the start of the military conflict in eastern Ukraine last spring, NATO forces have stepped up military exercises along the Russian border – in the Baltic States and Eastern Europe. In April, the Russian general staff noted there had been an 80-percent increase in training near Russia’s borders in 2014. The Russian military put together nearly 100 units and organizations in the Crimea last year as part of the program of deploying a self-sufficient group of forces at the peninsula after it rejoined Russia in the spring of 2014, said Russia’s Defense Minister Sergey Shoigu in March. There is no reason for the US to keep tactical nuclear weapons in Europe, Grushko said on Friday. He added that US tactical nuclear weapons are still deployed in non-nuclear NATO states, particularly in Belgium, Germany, Italy, the Netherlands and Turkey. “It is strictly forbidden under the NPT. The first article of the treaty prohibits nuclear countries to convey any nuclear arms or other nuclear explosive devices to anyone directly or indirectly." “The US must pull out these nuclear bombs to its territory. It would be a serious contribution to strategic stability and security in Europe," he concluded.